Liquid Crystal Polymers (LCPs) are the unique group of polymer which is partially crystalline aromatic polyester based on p-hydroxybenzoic acid and related monomers. LCPs have excellent ability to form high region of high ordered structure in the liquid state. LCPs possess various properties such as excellent mechanical properties at high temperature, high chemical inertness, inherent flame retardancy, and good weather ability which make it suitable for their use in making product miniaturization in the electrical & electronics industry and automotive industry. LCPs show low viscosity and high flow during Melting and Injection Molding. It has wide range industrial application in medical, aerospace, electrical & electronics industry and automotive industry. While it is highly consumed in making electronic components include Smartphone, Laptops, Tablets and others. Global Liquid Crystal Polymer Market is anticipated to flourish at significant CAGR over the forecast period. Further, the market of Liquid Crystal Polymer is anticipated to grow on the account of the increasing electronic products such as smartphones, laptops, tablets and others across the globe. Rising demand of LCPs for product miniaturization in aerospace and automotive industries are paving the way of growth of the Liquid Crystal Polymer Market during the forecast period. Geographically in 2016, Asia Pacific accounted for the highest percentage of market share in the regional platform and is expected to continue its dominance over the forecast period. 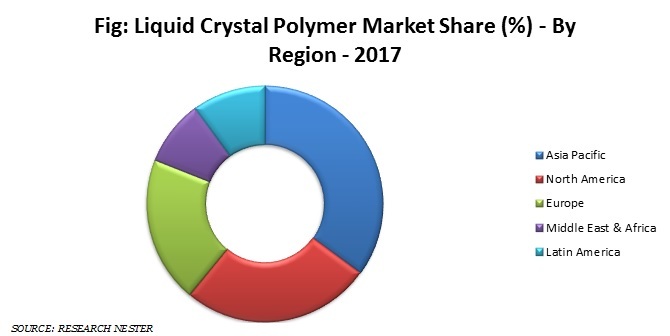 Further, shifting trend toward the miniaturization of electronic as well as electrical components such as SMT connectors, and other microelectronic devices is also expected to garner the growth of liquid crystal polymers market in upcoming years. Further Europe is expected to grow at a significant CAGR over the forecast period. Advancement and developing in electronic products is anticipated the garner growth of the liquid crystal polymer in near future. According to trend, rising demand for the miniaturized electronic products among the population is expected to be dynamic factor for the rapid growth of the Liquid Crystal Polymer Market over the forecast period. Moreover, Liquid Crystal Polymer is less harmful to the environment and enhanced the product performance and quality. Increasing expenditure in electronic product is expected to positive growth of the Liquid Crystal Polymer market over the forecast period. However, ability to form weak welds lines and highly anisotropic in nature is expected to dampen the growth of the Liquid Crystal Polymer Market during the forecast period.